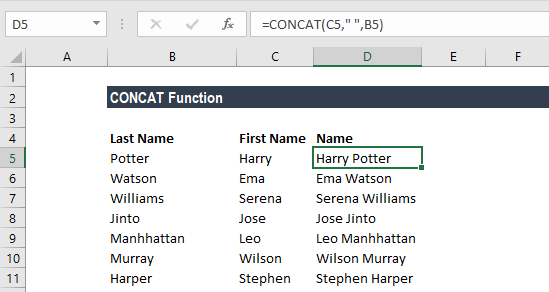 What is the CONCAT Function in Excel? 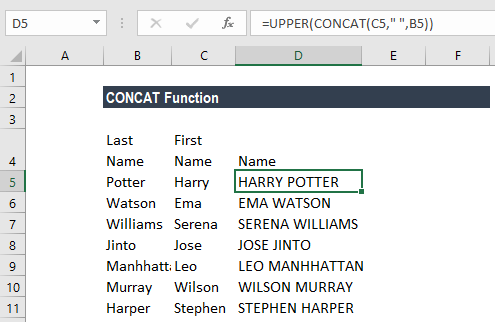 The CONCAT Function in Excel is a text function that is used for combining text in cells. 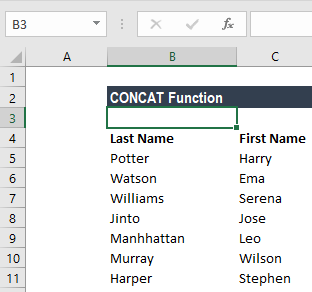 The function was introduced in MS Excel 2016 as a replacement to CONCATENATE function. However, you will find that both functions are available in MS Excel for backward compatibility. You will notice that the above result is not acceptable as there is no space in between the characters. CONCAT function combines the strings as we instruct it to do. What we got is a long string with the concatenated values running together. Let’s modify this formula to add a space. To do so, we need to add another argument “ ” (two double quotes around a space). Doing so will give us the space required between the characters. In above formulas, it is necessary to add a comma after each argument or the function will not work. 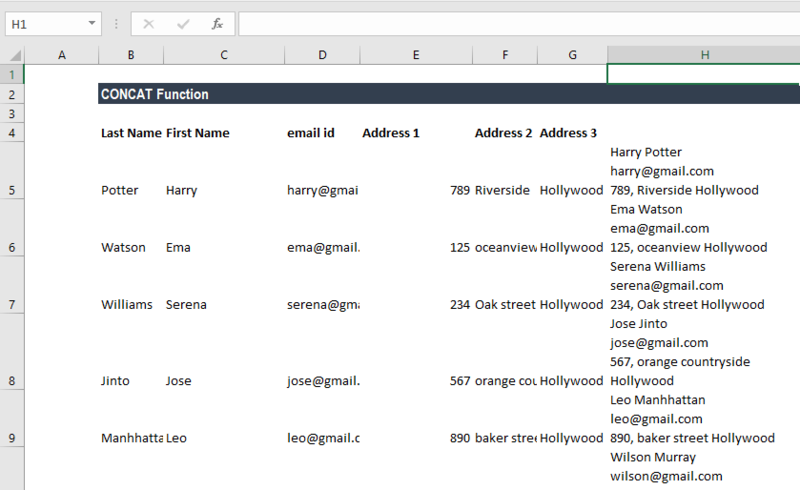 However, you need the entire name in one cell and in order of First name, Last name. 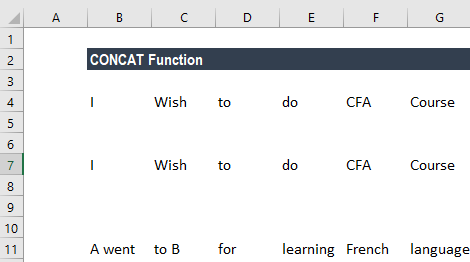 In this scenario, CONCAT function can be used. As we need the first name and then the last name, we would instruct the function to combine the strings in that manner. As discussed above, the formula to be used would be CONCAT(C5,” “,B5). 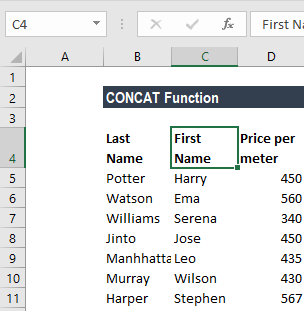 After typing the formula in D5, we can drag down the formula for all required cells using fill handle. So here we used CONCAT formula to combine strings and create a sentence with the additional information. In the above formula, we created a line break through CHAR 10 and merged values were separated using a comma (“, “) and space (” “). As we saw above, if we do not use spaces in between the text to separate text entries, the text entries will run together. So, while using CONCAT function, we need to add that extra space. To add the space, we add double quotation marks with a space between them ” “. Sometimes quotation marks will appear in the result. This happens when we forget to add a comma. For example, when we input formula =CONCAT(“Hello “”August”) we would get the result as Hello”August with an extra quote mark. The reason as mentioned is that we didn’t add space between the arguments. Reasons for #NAME? error. This error usually occurs when we have missed the quotation mark in the text argument. Reasons for #VALUE! Error. This error will occur when the resulting string exceeds 32,767 characters (cell limit). 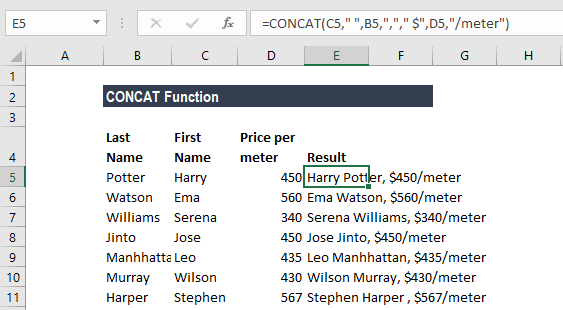 This function doesn’t recognize arrays so we need to list the cell references separately. Apart from double quotes, forward slash (/) and asterisk (*) can be used to separate the concatenated strings with other characters.